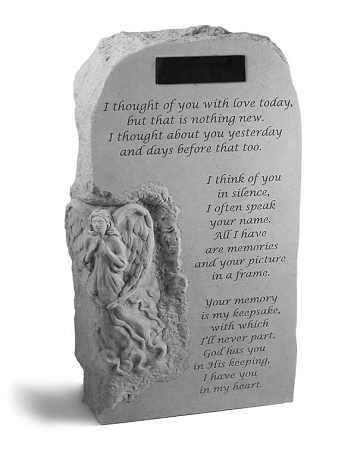 Angel Memorial Stone, Upright, Personalize - I Thought Of You..
Home > Specialty > Religious Theme > Angel Memorial Stone, Upright, Personalize - I Thought Of You..
Personalize this beautiful memorial obelisk. Designed by nationally recognized artist Pam Ballard, it is made to last forever. - Personalize this beautiful obelisk. - Designed by nationally recognized artist Pam Ballard. - Features a unique texture that makes it feel as if the stone was chiseled by hand. - Constructed of durable cast stone which has the look, feel and weight of true stone. This obelisk can be personalized with up to 3 lines with a maximum of 18 characters per line. Personalization is etched on a black marble plaque. "I thought of you with love today, but that is nothing new. I thought of you yesterday and days before that too. I think of you in silence. I often speak your name. All I have is memories and our picture in a frame. Your memory is my keepsake with which I'll never part. God has you in His keeping. I have you in my heart." Don't let the size fool you. On the website, I thought it was too big, but luckily I checked out the height. It's 23" high which is the perfect height next to my bushes. And, the text on the obelisk is exactly what I want to say. Memorial Stone - Until We Meet Again..
Memorial Stone, Upright - May You Find ComFort.. Ten Commandments in Cast Stone..